With just under 100 years since its inception, Brazilian Jiu-Jitsu (BJJ) has become the fastest growing martial art in recent time. 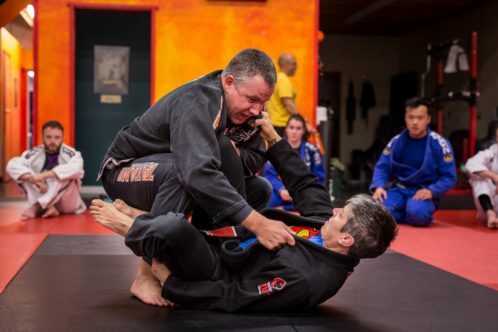 With the accelerated growth the reach of BJJ transcends all boundaries and stretches from one end of the earth to the other. According to Canadian native and BJJ Black belt Misty Shearer, the biggest difference between the BJJ scene in Canada and the USA is numbers. She says when she started training just over thirteen years ago, Canada only had a handful of Brazilians that dared to venture into the Canadian frontier. Perhaps at the time the idea of leaving the warm climate of Brazil for the below freezing temperatures of the Canadian terrain could have been a factor. She said of those that did make their way north, most settled into eastern Canada. Misty Shearer is the head instructor and owner of Brazil-021 Edmonton, under Andre Terencio & Hannette Staack. She says she has always been involved in combat sports, from Judo, Boxing, Kickboxing, Wrestling and she started dabbling in BJJ in about 2003. In the 90’s there wasn’t a lot of women in boxing and kickboxing so Misty took that as far as she could, then she got into wrestling at the University of Manitoba. She says she really liked it and competed at the Nationals but she started to get frustrated. At the time, she was in her late 20’s and just felt that she was too old to start such a technical sport. She also added that she kept going on her back, which she said felt natural. However as wrestling enthusiast knows, turning on your back is a big No No in wrestling. 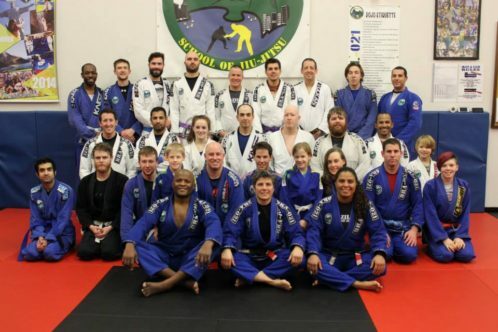 When Misty moved to Edmonton she stumbled across some guys that were grappling at a gym. She asked them about it and they directed her to one of the only clubs in the city. BJJ was still very new at the time and the club instructor was just a brand new blue belt. IIt should come as no surprise with Misty’s hunger for knowledge and natural born leadership skills she began her career as a BJJ instructor as a purple belt. She says as an instructor she was really able to fine tune her own practice; having to learn how different people learn and adapting, really having to study the technique to be able to teach and having to practicing them, over and over again took her BJJ to a new level. Then once she thought she had it, she would have to learn it again and think about how it works with other technique. She says the most enjoyable part of instructing is watching the “light bulb” go off in her student’s heads. She says you can see it in their face when that happens and then watching them pull the technique off in rolling, for Misty that’s the greatest thing. 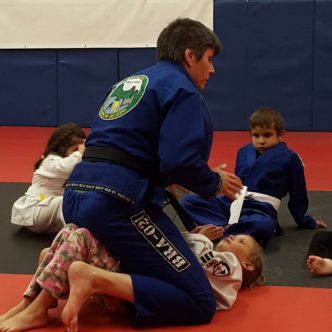 Misty says she loves teaching blue and purple belts; working with them to make what they know better, opening their eyes to the other possibilities in the moves or techniques. But perhaps more she loves teaching the kids. She says she never planned on teaching kids. We are taught in BJJ and in all Martial Arts the importance of respect and loyalty toward your instructor, team, teammates and academy. However, sometimes the feeling isn’t mutual. When consumed in a toxic environment we can often wear blinders and fall victim to blind loyalty. This was a lesson that Misty learned firsthand. By the time Misty reached a brown belt she decided it was time to leave her BJJ club to seek out a healthier environment. Leaving behind the politics of her former club, Misty struggled finding a new team that shared the same vision. It took her three teams before she finally found her new home. Almost four years ago she met Hannette Staack and instantly she knew she had found the team. Her and her club moved over to the Brazil-021 Team in 2013. She says through the trials and tribulations she has learned so many lessons both good and bad. Having taught for so many years by the time Misty reached black belt, the next logical step was to open her own club. Although it was a dream come true for Misty once again she was faced with adversary. Misty says it is hard enough being respected as a female black belt, but when you throw being a female club owner into the equation and it’s a whole other game. For example she says of the ten other clubs in her city and surrounding communities she is one of the few instructors and clubs registered with the IBJJF. 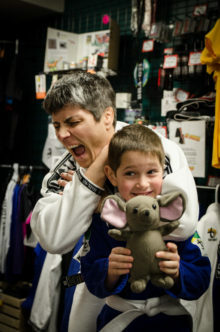 She and her students actively compete at local and IBJJF tournaments in the US. Of the ten clubs, maybe two of the black belts of other clubs in the area compete or are registered with IBJJF. Yet she and her club are barely noticed, nor thought about. She adds that there are even schools that have purple belt main instructors that are given more regard than her. She says that for some of these schools the instructors lack credentials and they have to use seminars they have attended as reference on their bios. Although being a female black belt and club owner is no easy task, Misty says that she doesn’t let the opinions of others bother her. She feels extremely grateful to have a great and loyal team. She has also succeeded in creating a safe and great place to teach and train. As for students that don’t like the idea of being taught by a women or feel she doesn’t have anything to offer, she says she doesn’t want them as students anyways. Having come from what could be described as a toxic training environment, it is of utmost importance for Misty to provide a healthy and positive environment for her students to train and flourish. Combine that with her natural leadership qualities and her and eighteen years Military experience Misty is one hell of a leader. So what is the secret to her success? Misty says that being a good role model, being flexible and providing opportunities for her students to freely contribute input is crucial. Such a great write-up! It’s like I’m actually talking to her! I’ve been a student under Misty’s guidance for just over 4 years now and I can say the only thing I regret is not joining the club earlier. As stated in the article, she is very knowledgeable, but never too proud of her many accomplishments. She shares her deep understanding of BJJ (and grappling in general) with all who want to learn and grow. She’ll listen to what anyone has to say, and knows how to interpret the student’s inputs to make the gym a better place to train and grow in BJJ and in life.